Although many students claim DePauw University is “in a bubble,” it appears even a school in rural Indiana follows national trends, specifically the decreasing numbers of students majoring in the humanities. The humanities include English, history, classics, and philosophy. According to study completed by American Academy of Arts & Sciences, the number of bachelor degrees in humanities decreased by 8.7 percent between 2012 and 2014. The same study found that out all of the bachelor’s degrees awarded in 2014 only 6.7 percent were in the core humanities, greatly reduced from 17.2 percent in 1967. The affected departments as well the Administration are working to combat this decrease, because of the large role humanities play in the liberal arts experience. Out of the 45 majors DePauw offers, 50 percent of students major in either biology, computer science, communication, economics, and English. Out of those five majors, English is the only discipline that is a part of the humanities. Harry Brown, chair of the English department, thinks student may not be interested in pursuing the humanities because it is perceived as less financially lucrative. one distribution area. Students can avoid taking a humanities courses throughout their four years, but still fulfill the requirement by taking two courses in the arts. “What we’re finding with the graduation requirements are that students are taking fewer 100 level humanities courses. In other words, you can graduate from DePauw without ever taking philosophy, art history, English, history,” said Anne Harris, vice president for academic affairs and a former professor of art history. In 2012, following the implementation of the current core curriculum allowing arts course to be substituted for humanities, humanities numbers started dropping. It is normal for universities to review their graduation requirements from time to time, and according to Harris, it appears that DePauw is about to do the same. “I think we’re on the cusp of doing exactly that here, which is to kind of examine what is it that is specific to the arts and to the humanities that we want every DePauw student to experience,” Harris said. 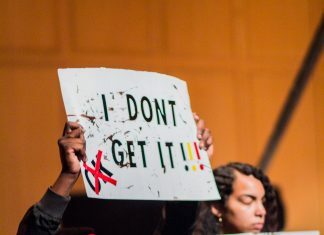 Additionally, Harris reported that these talks to separately define the arts and humanities so that the two will not be lumped together under the same requirement may happen as soon as next semester through a curriculum committee and faculty input. The department chairs for these majors are also making changes to increase student interest, mainly through increasing the number of introductory courses and the topics. Similar changes are being made to the English and philosophy departments. The philosophy department has also attempted to highlight the success of its students. “We also have sheets where we publicize how well students do on the GMAT, on the LSAT, and the GRE, so that people understand that there are concrete benefits,” McKelligan said.